I am always in for an action movie. I’ve been a fan of them since I was a kid and my favorite films always included martial arts. There are a slew of bad films that think if they throw in a couple of fight scenes and a cheap story you’ll walk off with an “instant classic”. This is obviously not the case as like any other great film it takes certain elements and strong storytelling to capture an audiences attention. Fight scenes are a skill all their own, as they are their own story altogether; slowly building from the first strike thrown to its epic conclusion that can compared to conducting a orchestra. 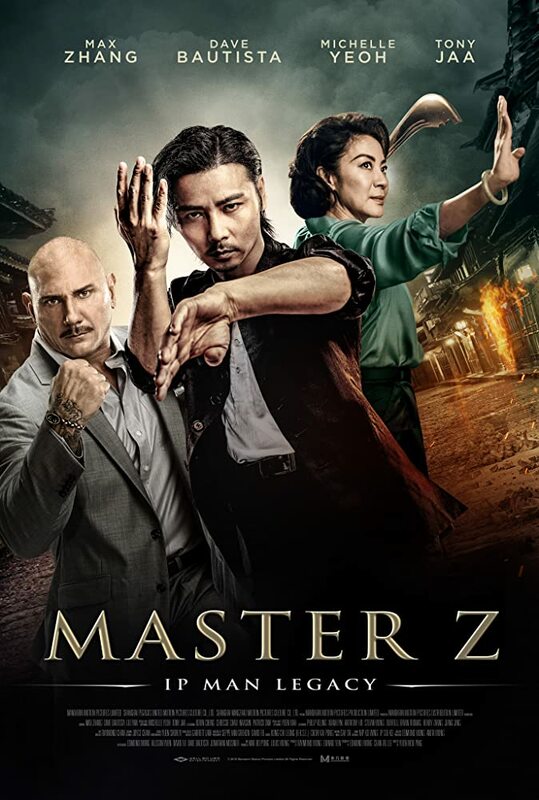 Veteran stunt coordinator/martial arts filmmaker Woo-Ping Yuen (Drunken Master, Iron Monkey) has expanded upon the Ip Man universe with his film Master Z: Ip Man Legacy. I will begin by saying I have not seen the prior three films starring Donnie Yen. The only connection to the prior films is that the main character Cheung Tin-chi, played by Jin Zhang, challenged Ip Man in the third film of the series and lost. This film follows Cheung after his defeat along with his young son who try to live a simple life. Serving as a spin off it is easy to jump into this story without worrying about not seeing the prior trilogy; the story is enhanced by using flashbacks allowing no viewer to feel left behind in the story. There is added star power too with Dave Bautista, Michelle Yeoh and a small appearance by Tony Jaa. What drove this story forward was the solid story and acting throughout. Each relationship is well established; not only between our heroes but also the villains. I feel by spending just as much time with the villains offered a better insight into who they are as actual people opposed to generic stereotypes. With well established characters and solid story the action sequences serve as the cherry on top. Each fight has their own identity and none feel equal. Jin serves as a powerful protagonist as it is easy to admire his character and immediately embrace him as our hero. I feel we’re also treated to a bit extra too after the epic finale concludes we are offered a bit of an epilogue. The standout I thought was Dave Bautista who served as a towering, statuesque, beast of a human being. His fight scenes reminded of those with Kareem Abdul-Jabbar and Bruce Lee in Game of Death. In those scenes they played to Abdul-Jabbar’s strengths which were his height and long limbs; here Dave plays the brick house, power boxer with his solid frame/core and strong punch combinations being his advantage. They also used Dave’s wrestling background as there were a few pro-wrestling moves used; none that look too wacky and fit the fight. It is hard to not enjoy this film and not appreciate the work put into the fight choreography. My experience with this film makes me want to go back and watch the original trilogy with Donnie Yen. My hope is this continues to expand upon the Ip Man universe and offer more stories equally as entertaining.